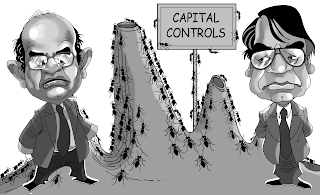 The Leap Blog: Futility of capital controls? I read a fascinating story by N. S. Vageesh in Hindu Business Line titled Overseas borrowings continue to grow, about the October data on ECB. I had heard stories about RBI trying to have capital controls against ECB, through bureaucratic tactics, which exceed the restrictions in the stated policy on ECBs. On this subject, Vageesh says: "Subsequently, there were reports that the RBI was keeping a number of applications for borrowing pending in view of the unprecedented inflows of forex during this period." It's striking to notice that despite these efforts, there has been no easing up of the difficulty of preventing INR appreciation above Rs.39 in September and October. I put together my thoughts on this in an article titled Futility of capital controls? in Business Standard today. Similar stories are being acted out elsewhere in the world. The Economist had a fascinating story about the leakiness of Chinese capital controls.